Since October 2011, the Maru has been conducting population and biodiversity surveys recording the presence and abundance of certain cichlid species around Kande Island in the northern region of Lake Malawi. While some species are abundant year round, others come and go. By analyzing the data patterns of species abundance and scarcity can be determined. We've also been able to put together graphs to display the change in total numbers of all the species that we monitor. Transect line surveys are conducted in two separate locations at Kande Island and the Outer Reef. Initially population and biodiversity surveys were completed twice a month: on the 1st and 15th. Having established that population and biodiversity trends could still be reliably tracked at a less frequent survey interval it was decided to conduct surveys once a month and to expand the number of survey sites. To perform the surveys, two fifty meter swims are done along a fixed transect line. While swimming, the surveyor identifies which species and how many are present in a one meter radius around the line and records the data on an underwater slate. The data is entered into an excel spreadsheet and a graph for each species is updated monthly. The graphs are then analyzed. 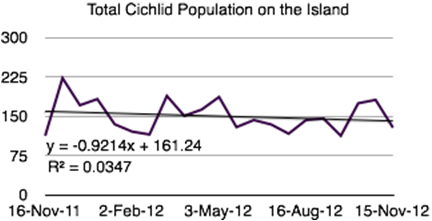 The first two graphs show that at both sites there has been a decline in the total numbers of fish. Year on data at the Outer Reef shows a 27% decrease however at Kande Island the decrease is more marginal. To determine the factors relating to the decline in species numbers, it is important to find patterns of when fish species are more or less abundant. Graphs 3 and 4 show the relationships between eight different species on the outer reef while Graphs 5 and 6 show the abundances of eight species on the island that seem to track each other.. At the Outer Reef we were able to find selected species that appear to share ecological niches and thus vary in abundance at roughly opposite times. However at Kande Island we couldn't find similar relationships between any two groups of species. Why niche sharing could be found at the Outer Reef but not at Kande Island could be due to any number of factors. There is still much to learn! Stay tuned, or join us in the discovery! Visit http://www.themaru.org to learn more about the Maru's research programs and how you can get involved. This blog post was written by Brianna, Tierney, an intern at the Maru Research Center. Thanks for the effort of this work but i wonder if this website is updated on Research and Education part as people are eager to help for development of the project but how can they access the achievement if it is not published.